Our Chairman, Brian Dawson had a hip replacement in April. After his hospital stay he graduated from having two arm crutches to one, and then dispensed with them both at the end of May. The surgeon is happy with Brian's progress but showed him the x-ray which indicates that he will have to have the other hip replaced within a 6 to 9 month period! We wish Brian all the best; happily he is back on his feet and (carefully) getting some gardening done. Jack Adams has very kindly volunteered to take the position of Social Secretary, and Chris Hatton has offered to take over his role as Route Advisor. Jack writes, Chris has a wealth of knowledge of walking routes, which I have always found to be the most difficult to plan, and he will be a great asset to the Association. Thank you to both Jack and Chris for volunteering their time, and helping prospective members. The grinning shop assistant said, "Excuse me, can you ride?" Although I'm not the one to talk - I hate a man that blows. I'll ride this here two-wheeled concern right straight away at sight." It whistled down the awful slope towards the Dead Man's Creek. But Mulga Bill, as white as chalk, clung tight to every bound. But that was sure the derndest ride that I've encountered yet. A horse's back is good enough henceforth for Mulga Bill." David Jones of Bristol completed the journey by motorcycle on 14 June. He drove from 4am to 10pm! Jamie Methuen of Monmouthshire also drove by motorcycle: from John O’Groats to Land’s End via the four most extreme points. It was an ambition for many years, and two years in the planning since finishing work. 99% went according to plan. Low points were during the early weeks: constant rain, deep mud, and boggy, flooded marshes. High points were all the friendly, helpful, generous, supportive people I met along the way while I was carrying a 22kg pack. I lost 25lbs in weight. I had the best weather in Scotland for most of June. This journey was to mark my 50th birthday and my son's 18th birthday. We did it because we wanted to, in an old Land Rover, just to prove that it could do it. We drove via A-roads only, because it added a further challenge. A low point was the dismal weather on the west coast of Scotland, and the high points were all the funny, great and inspiring people and places we saw on the way. Welcome to all our new members. 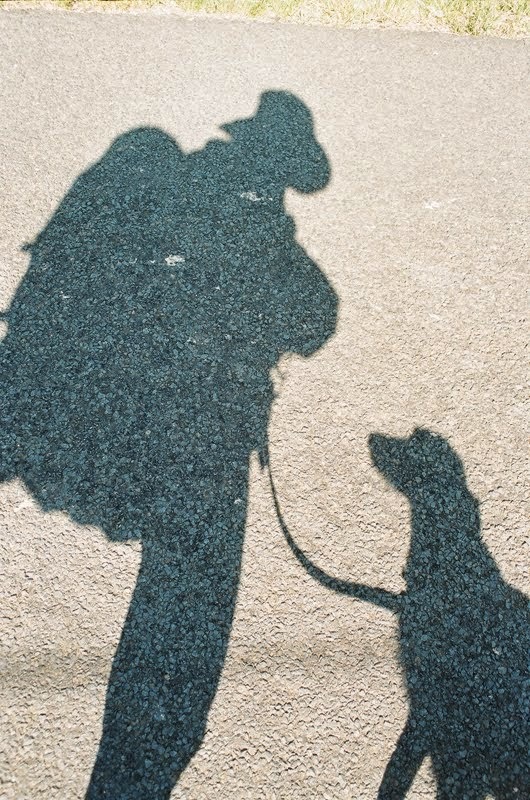 We would love to read more about your journeys, and please send us any photographs you would like to share. Carolyn Dixon of Oxford is a new Associate Member. She will be travelling by train or bus along with her son Caspar Dixon, who is cycling the Deloitte Ride Across Britain from 6th—14th September 2014. He turned 40 this year and thought it a good way to mark his birthday. Caspar lives in Singapore, and his ride will raise money for ShelterBox. Welcome to the Association, Carolyn, and good luck with your journey! Have any of our members previously taken part in this challenge? Sunday 14th September: train/bus from Kyle of Sutherland to John O'Groats; accommodation at or near John O'Groats. Whichever route is chosen for the End-to-End journey, it will pass not very far from some or several Munros. The definition of this term is mountains in Scotland that are at least 3,000 feet (approximately 914 metres) high. The person behind the name was Sir Hugh Thomas Munro, 4th Baronet of Lindertis. Born in London in 1856 but brought up on the family estate of Lindertis near Kirriemuir in Angus, he became a passionate mountaineer and also travelled extensively abroad. Despite being active in politics he failed to become an MP. At the outbreak of the First World War he was too old for active military service but did volunteer work with the Red Cross in Malta and also in France. After the war, during the influenza pandemic (the Spanish flu), he caught the infection, which developed into pneumonia and he died in 1919 at the age of 63. Sir Hugh would no doubt have been surprised and, perhaps, also pleased, if he had known that his surname is today being used as a generic noun. His name lives on because he published a list, later known as the Munros Tables, of the mountains according to the above definition in the Scottish Mountaineering Club Journal in 1891. This fascinated a lot of people and stimulated, and still does, hillwalkers to “bag” some or all of the Munros. There is even a term for this affliction – munroitis. More than 5,000 persons are now registered by the Scottish Mountaineering Club as having “compleated” the list. The first person to climb all the original Munros may have been the Rev. A.E. Robertson, in 1901. The first continuous trip was made in 1974 by Hamish Brown, one of Britain´s great walkers and mountaineers. His journey lasted 112 days and he used a bicycle for transport, and ferries to the Hebrides. And, yes, he has also walked JOGLE, in 1979, and not by the shortest route; he visited several of the Munros, the Four Peaks of Britain and even traversed Ireland during his journey! And then there are, of course, the record breakers. The current record holder seems to be Stephen Pyke. He made his self-propelled round in 2010 and it took him 39 days, 9 hours and 6 minutes. He did not use any motorized transport, only a bicycle and a canoe. The original Munros Tables list 283 summits, which Sir Hugh regarded as separate mountains, and 256 subsidiary tops. Unfortunately, except for the minimum height, Sir Hugh did not specify distinct topographic criteria for a peak to qualify as a Munro and this has given rise to some debate. The Munros Tables have been changed several times. Recently, new height data caused a further revision. A few peaks have been demoted from Munro status and a few have been added and the current number of Munros is 282. The old methods of height measurement seem to have been surprisingly accurate. Land surveying in the period we are talking about, around 1890, was a complex and painstaking process, requiring a car-load or, perhaps, a horse-drawn carriage, of technical paraphernalia, such as pedometers, pace measuring chains, plane tables, calibrated brass plates, tripods, plumb lines, telescopic sights, barometers, theodolites, triangulation instruments, current maps etc. – and the knowledge to use them. Sir Hugh´s main source of information was the Ordnance Survey´s maps of Scotland, one-inch and six-inch to the mile. The one-inch map showed contour lines but only at 250 feet intervals. He must have spent a great number of days poring over the maps, in addition to going on many expeditions in Scotland. Sir Hugh conferred frequently with fellow hillwalkers, who often carried aneroid barometers, which work on the principle that air pressure lessens with increasing altitude at a measurable rate. Air pressure is also affected by temperature changes and it required an experienced person to obtain accurate results. During the End-to-End journey one has the option of adding one or more of the Munros to one´s list of achievements. As for myself, I had, during my homework, identified Schiehallion as one of the most accessible Munros and it was close to my route. On 8 November, 1996, I was walking on the B846 towards Tummel Bridge and saw the geometric cone of Schiehallion about four miles to the west. I have to confess that I decided to leave it alone, mainly because it would have cost me another day and I saw little point in “bagging” an easy Munro and further damaging the already heavily eroded footpath to the top. At least I had said hello to a Munro, even if from a distance. I was never keen on hillwalking but it would certainly have been nice to have summited Mount Everest, preferably without using supplemental oxygen, which purists regard as unsporting. My only, very modest, mountain experience was on 8 August, 1979, when I went up Mount Hekla, the highest mountain in Iceland. Hekla is 4,892 feet (1,491 metres) in height, and thus towers over the highest Munro, Ben Nevis, which is 4,409 feet (1,344 metres) and also has the distinction of being the highest mountain in the British Isles. Climbing Hekla does not require any mountaineering skills but a reasonable degree of fitness. The ascent is scenic but, occasionally, unpleasant because of the sulphurous fumes and the gurgling sounds from the underground. In medieval times Hekla was thought, not unreasonably, to be a gateway to hell and a meeting place for witches. While at the highest point, I kicked loose the then peak, a piece of lava the size and shape of a grey, porous skullcap. It weighs 1,751 grams and now rests on one of my bookshelves. Hekla is an active volcano and seems to have an eruption every ten years or so (1970, 1980, 1981, 1991, 2000). But I am straying from the topic. Let us get back to Scotland. Many of the Munros have fascinating names, some of which are quite a mouthful. What about the following examples? The latter peak, which rises from the summit of Sgùrr Deargh on the Isle of Skye, has the reputation of being the most difficult Munro but, despite the name, it can be reached by rock climbing. There are also other classification schemes in Scotland - the Corbetts, peaks between 2,500–3,000 feet (762-914 metres) and the Grahams, 2,000-2,500 feet (610-762 metres). And, believe it or not, there are also the Marilyns, with a wink to Marilyn Monroe (? ), who, sadly, died prematurely in 1962. Marilyns are hills or mountains in the United Kingdom, the Republic of Ireland or Isle of Man that are at least 492 feet (150 metres) high. Sir Hugh had, no doubt, intended to visit all his peaks but he saved a few for later enjoyment. One of the peaks he did not get around to, was the Inaccessible Pinnacle. Death intervened. If anyone ever deserved a full “bag”, surely it would have been Sir Hugh. For a delightful picture of him in his state-of-the-art mountaineering outfit, held by the Scottish Mountaineering Club Archives, click here. This book, which is well-researched (the author has made the full round) and has many maps and dramatic photographs, will be helpful to anyone planning an expedition to the Munros and it is also suitable for the armchair traveller. This book has nothing directly to do with the Munros but it is a delightful novel about whether a particular protuberance in the Welsh terrain is a hill or a mountain and gives interesting insights into land surveying about one hundred years ago and also, perhaps, into the Welsh soul. It was filmed in 1995 – the book, not the soul. something about a soldier that is fine, fine, fine. he may be a simple private of the line, line, line. something about his buttons all a-shine, shine, shine. Oh, a military chest seems to suit the ladies best. There’s something about a soldier that is fine, fine, fine. ……….So now you all know the odd word! “I have a hell of a game sorting out the words. They have been jaggled, jeggled, jiggled, juggled and yes, even JOGLED (get it?). Well, never mind, because I’ve decided the odd word out is………. (WAIT FOR IT……………) SOLDIER”. With that single sentence, “……you’ll know where I am……….” he poses more questions than he’s answered. What does he mean by it? I obviously scrutinized the postmark on the envelope (something I don’t normally do) which clearly stated Southampton. Now that is interesting. At the risk of upsetting somebody or everybody, for which apologies in advance, surely Southampton is not somewhere people go for a holiday. It might be a means to an end but it can hardly be considered an end in itself…………can it? So, casually telling us “you’ll know where I am……….” does no such thing. Where is his holiday destination? I think of Southampton primarily as a ferry and liner/cruise ship terminal. So I deduce his holiday must be in one of three places. The first is the nearest from the mainland – the Isle of Wight, a popular and much visited island which he could comfortably cycle round in a day. The second is a trans-Atlantic voyage on one of the Queens to New York for sightseeing and self- indulgent RT and the third is a cruise on one of the many ships for which Southampton is the home port. Did the ship turn left at the Nab Tower for a northern European destination, e.g. the Baltic, or right to the Med. for the Balearics, or even the Caribbean? I think we are entitled to know and we should not have to guess or speculate, so please, Mr. Teabags, write to our Editor with a full and frank explanation so she can publish it in the winter issue. An account of your vacational antics would be even better. The next response, as an e-mail attachment, came from highly respected and long-standing member from Sweden, Krister Andrén. His correct/incorrect pairings were very similar to Mr. Teabags’s though his “odd” word was not correct. Considering English is not his first language I have the greatest admiration for him. Apart from the word Hej which he has taught me and means Hello I don’t know a word of Swedish let alone begin to understand or attempt to answer a similar quiz all in Swedish! 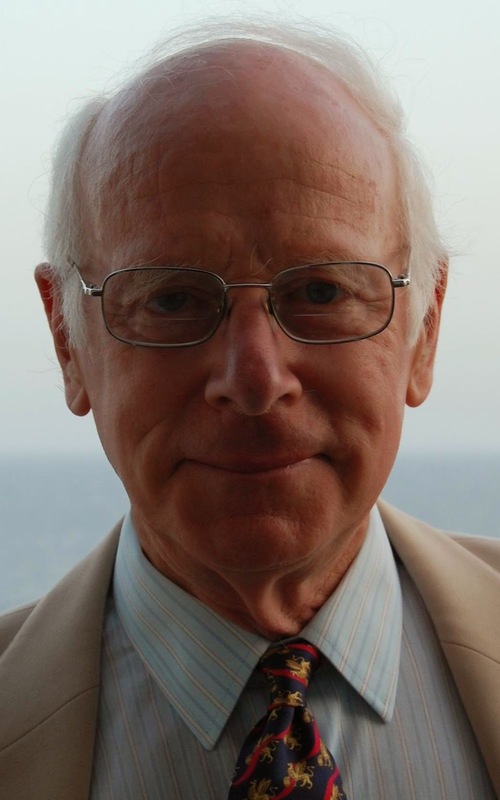 I then received two more solutions – from John and Margaret Desborough. Their envelope was addressed to “Quiz Master Extraordinaire”. Save for a single word being switched, they were identical. You will see the solution I was looking for at the end of this article and it is different from John’s and Margaret’s though that is not to infer that theirs are wrong; just not quite the same and frankly I never knew that “soldier” and “hammer” were both types of orchid – hence flowers. For the two synonyms they both gave “joy” and “triumph” whereas I expected “joy” and “elation” only to be informed that “elation” is apparently the model of a Citroen car! Never knew that either! Interestingly, in my Collins Paperback Thesaurus, “triumph” is not given as a synonym for “joy” (whereas “elation” is), though “joy” is given as a synonym for “triumph” (as is “elation”). An anomaly and a dilemma for me. However, I think and hope you all agree with me that “test” is not normally associated with “crossing” (as they have asserted). Are not “ford” and “double” more obvious or am I missing something? Krister enquires how I construct my puzzles: “Could you perhaps tell us sufferers a little bit about it? 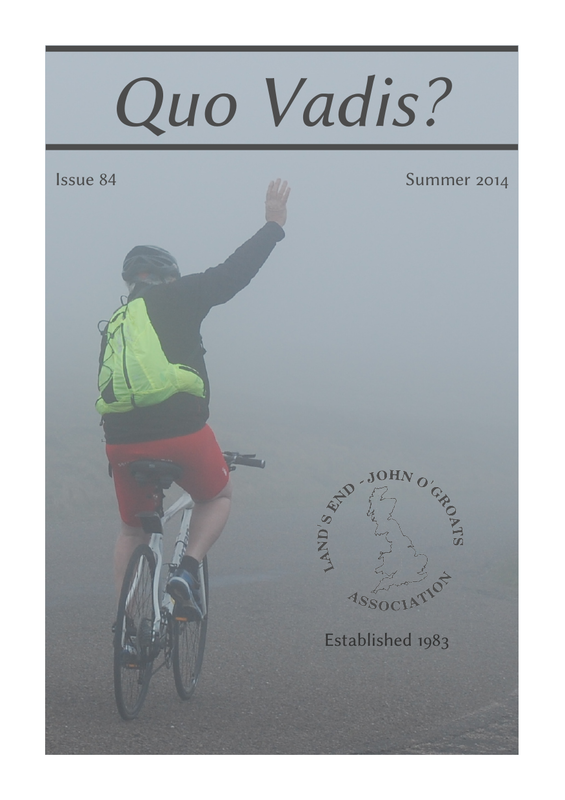 A page or two in the next QV? ?”.Well, Krister, it hardly deserves that amount of space. I remembered that years ago the Sunday Telegraph ran an Elimination Puzzle so I decided to replicate it. Constructing one is a lot easier (I find) than trying to solve one (the same goes for crosswords). All I do is think of a word with which perhaps two or more can be associated. For example, the word black has many associations – “mark”, “day” and “board” are just three possibilities. But each of those words may also be associated with others – mark = “water”, “tide”, “hall”; day = “time”, “break”, “wedding” and board = “room”, “hard”, “card”, “drawing” etc. and drawing might go with “pin” or “room” (again!). So that’s easy; the tricky bit is for you to sort out which is which and which cannot be associated – for example “board” and “tide” don’t go together, nor do “black” and “pin”. Another old chestnut is the “flower”. Is this a river or a bloom? Of course, anagrams and synonyms usually and hopefully have no alternatives (except when J or M D are around!) and some pairings are “straight” – e.g. two birds – skylark and goldcrest, neither of which has other words with which they can commonly be linked (at least I don’t think so!). The knack is to have pairs of words that are neither too obvious nor too obscure. I assure you it is a lot simpler than you might think. So now it’s your turn, Krister. You relish a challenge and I’m sure that for a man who has walked End to End pushing a rebuilt shopping trolley containing your paraphernalia you’ll find this a doddle. I know Katharine is longing to hear from you and it’s an opportunity for you to wreak revenge – and exhort me to have a go! I’m looking forward to doing so after your puzzle appears in next winter’s issue – if it’s not too difficult! Just one condition, though. Please do it in English! Most of us have trouble coping with our own language and we get few enough solutions as it is, so to do it in Swedish would really put the mockers on it!! I have often amused myself with your puzzles in the past but I have never given enough time to get anywhere near a solution. However, on this occasion I think I have paired off 36 words fairly logically so I am writing in to say I make the odd one out No. 19 – soldier." John attached the spreadsheet on which he had given his pairings …………………. And WAIT FOR IT…….. I am delighted to announce that they were spot on – all of them correct! Congratulations John! A much deserved book token has been posted to him. Since typing this in late April I have been patiently waiting to hear more from Mr. Teabags. It is now almost the end of May and so far not a word. Nothing. From this I deduce there are two possible explanations: either he is still enjoying his protracted holiday or he is still tackling the last issue. Surely he could not have forgotten……………. After completing the first challenge successfully of driving a vintage fire engine from Land’s End to John O’Groats and back, the fumes, concentration and the constant threat of breaking down in itself would put most people off attempting to drive vintage vehicles from one end of the country to the other and back, again. But to make up for all that I took great comfort in the people I met on the way - so kind, helpful and willing to assist you on your way. Thanks to the like-minded people who relish the challenge and shared their experiences, I decided to complete the challenge. 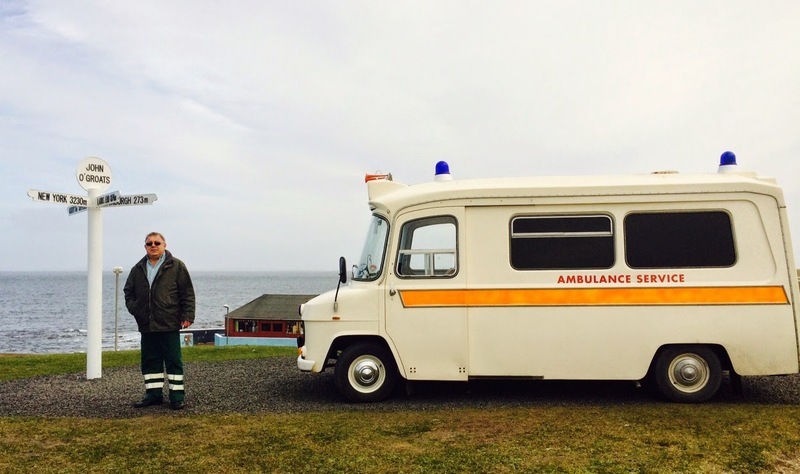 I started to look around for a vintage Ambulance, but finding one was not easy. Most were either converted into mobile homes or ice-cream vans and the rest were in museums. There were a few in private hands but they were not for sale at any price. It was only by chance I stumbled across an advert “Ambulance for hire” on the net. It was about the right age, and being used in the filming industry. I rang the gentleman hoping to hire it and as luck would have it he had just decided to sell it that week, so I bought it there and then on the phone. That was October last year. It took me about three months to go through the engine and all the working parts so that I was confident it had a chance to make such a long journey. Once that was completed it was just a matter of timing time off work and the weather, so I decided to do the first part from Bridgwater to Land’s End and back over a weekend to save holiday from work, leaving on Friday night and hoping to be back Sunday afternoon. I waited and waited but it was not until March that the weather was good enough to go. The first leg of the journey was non-eventful. 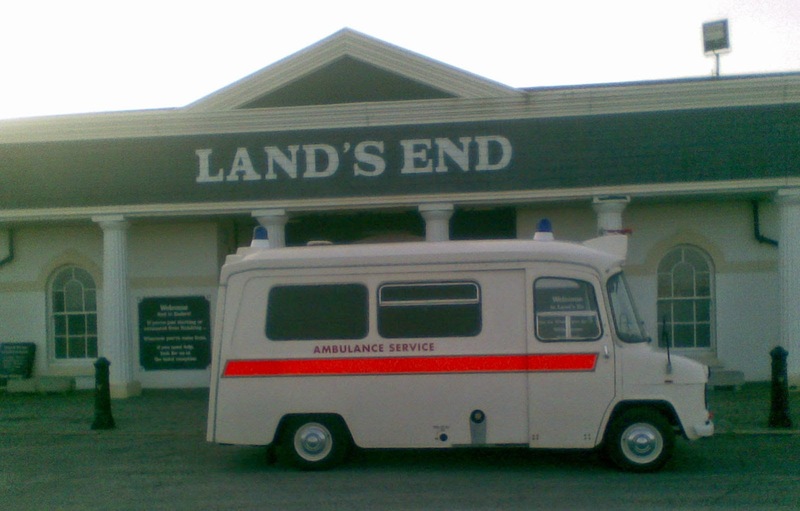 From Bridgwater to Land’s End I quite enjoyed waving to people who stopped and stared at the old Ambulance passing by. On the return leg it was different: first there was a puncture, then the engine started to play up, and finally the exhaust developed a large hole in it, so I was glad to see the Bridgwater sign. I spent about a week or so repairing the Ambulance with a new exhaust box and two new tyres. The engine was more problematic - it took me ages to work out why it kept spluttering and losing power. Finally by process of elimination I found the petrol tank had been contaminated with either rust or sand and was clogging up the carburettor thus starving the engine of fuel. Now with the Ambulance fitted with a fuel filter and its petrol tank cleaned, I started to think of the next leg, Bridgwater to John O’Groats and back, and also count my blessings that these problems hadn’t occurred somewhere in the remote parts of Scotland. As I said at the beginning, the weather was being watched for the best time to attempt the journey. It was still snowing in the highlands of Scotland and I needed a window of opportunity to go on the second leg. Some may say, “Why not wait for summer?” - my ideal was to attempt the journey in the early part of the year so that the temperature would be lower. This would help keep the engine cooler as engines of that age were not designed to cool themselves as well as modern ones. Finally the window of opportunity came and I set off carrying spares and food. The first day went well and the weather was good. Traffic was light and I made good headway: after seven hours and three hundred miles of driving I arrived on the Scottish border and parked for the night. I used the Ambulance as a mobile home - the bed was quite comfortable. I had a good night’s sleep only to wake to the Ambulance surrounded by local people who were wondering where this old Ambulance had come from. The second day was just as good - weather fine and traffic light. The trip through the mountains was quite splendid. The snow line was level with the road but not on it; at one time I could see both the sun and the moon, and as night fell which was about one hour early in that part of Scotland, the light on the mountains was quite eerie. I made just short of Inverness that night. The Ambulance was going great and by then I started to relax and enjoy it. The third day I reached John O Groat’s around dinner time with no problems, took some photos and chatted with the locals and had the Ambulance pictured outside the local coffee shop so they could put it on their website. I started the journey back at about three in the afternoon after offering a lift to a fellow traveller who want a ride back to the nearest large town, which was Thurso - and he enjoyed the ride. From Thurso I set off again, hoping to get to Nettle Bridge which is south of Inverness, where I knew I could get a great breakfast in a golf club in the morning. Night fell and I found myself getting quite tired so I stopped for a rest and wondered if I should stay the night there or go on. I decided to do the last sixty miles on to Nettle Bridge. I found on the way up that it was better to travel in the early morning and early evening to avoid holding up traffic, as I was only capable of about forty-five miles per hour top speed, and long queues were forming behind me on single carriageways, and I had a few people wave at me for the wrong reasons. After a good night’s sleep in Nettle Bridge and a good breakfast I decided to stay and look around the area for a few hours to give me more time to rest, and later that day set off for the border taking the A9 south though the snow-capped mountains. The weather had got quite bad: it started to snow, and there were gale-force winds for about seventy miles. On the other side of the mountains the weather became a lot better with some showers and light winds. All was going great until about fifteen miles north of Perth when the exhaust came off and the Ambulance was making a horrible noise. I pulled into an industrial park where a garage mechanic put it on a ramp so he could see where it was damaged or had come off, and told me to come back in about an hour, which I did after going downtown and getting a paper. When I got back to the garage not only was the Ambulance fixed but there was a crowd of people who had come to see this vintage vehicle. Having spent about an hour talking with them, I went to pay the garage mechanic and to my astonishment he would not let me pay: “On the house!” he said, “Anybody who drives a vehicle like that from one end of the country to the other needs all the help he can get.” With that I went to the local shop and bought him some flowers for his wife and a bottle of wine for him, and went back to the garage to give it to him. In his Scottish voice he said, “’Ark I’ll not take both those home in the same week laddie - she will think I’m going soft. I’ll take the flowers today and the wine next week, thank you!” With that, off I went, heading south on the way to the border. Having spent a night on the border, I set off down the M6 to the M5 all the way to Bridgwater for home. This was uneventful other than I had an Ambulance on a blue light run slow on the M5 as they passed so they could take a photo! Now I’m going to have a well-earned rest before I attempt the third challenge with a Police car, which I have already bought. Cyclists desperate to improve safety on Cornwall’s main arterial road, the A30, on which two End to End cyclists died last year after collision with a lorry, are hoping to place life-sized model cyclists along the route to alert drivers of their presence. Bike Cornwall, the local cycling group, are campaigning to install the models and a spokesman for the group said that most cyclists on the dual carriageway section of the road are End to Enders who want to get through Cornwall very fast and the road often sees vehicle speeds in excess of 70 and 80mph. The spokesman added that there is no signage warning drivers about cyclists, more and more of whom were taking that route because it was the quickest way through Cornwall. He thought models would be a great way of engaging the community, and children could design signs and make it a campaign to raise awareness. A CTC official explained that the Highways Agency would probably remove any model bikes because of the possible distraction for drivers. This is ironic, as it is to show people are not observing cyclists on the road. He added that campaigners were in talks with the council to add a cycle track along sections of the A30 as part of a road-widening scheme but were falling foul of the usual excuses. It was yet another scheme where, despite a national commitment to improve cycle safety, at a local level there were the familiar reasons for not doing so - lack of money and insufficient space and cyclists. He believed the council was not looking to the future and the CTC wanted to increase tourism, and considered that many more people would use it for commuting if it were safer to use.